The Sidney Myer Music Bowl project came about through the auspices of the Sidney Myer Charitable Trust which was established upon the death of the founder of the Myer Department Store empire, Simcha Baevski (Sidney) Myer. Myer's nephew Norman Myer oversaw completion of the project in his role as chairman of the Trust. The provision of a sound shell in the Domain area had been publically mooted as early as the late 1940s but this had not amounted to any substantial action. The Myer project was discussed in the mid-1950s with the architectural firms of Yuncken, Freeman, Griffiths and Simpson and Grounds, Romberg and Boyd being invited to participate in a joint design exercise. In September 1956 Yuncken Freeman Architects, Griffiths and Simpson took control of the project following a joint meeting of the two firms. The project architect was Barry Patten. The Sidney Myer Music Bowl was constructed throughout 1958 to Patten's design and involved the integration of a tensile structure and landscape into an organic and harmonious relationship. The construction system consisted of cables laced together and covered with aluminium faced plywood sandwich panels. Many new techniques were developed throughout construction to ensure that the structure remained aerodynamically stable yet flexible and watertight. Ground anchors were developed to be corrosion resistant. The shell was also required to be acoustically correct and its construction saw the employment of Italian migrant riggers who had previously worked on the construction of Australian television towers. The bowl was officially opened by Prime Minister Robert Menzies on 12 February 1959 to an audience of some 30,000. Later the same month the American evangelist Billy Graham drew crowds in excess of 70,000 to the bowl. The Sidney Myer Music Bowl has remained in continued use since its opening, drawing large crowds to cultural and sometimes evangelical events. The Sidney Myer Music Bowl is of historic, cultural, aesthetic (architectural) and technical importance to Victoria. The Sidney Myer Music Bowl is of historical importance for its association with the Sidney Myer Charitable Trust established after the death of the founder of the Myer Department Store empire Simcha Baevski Myer, and for its association with the Myer family particularly Norman Myer the chairman of the Trust who oversaw the completion of the project. The Sidney Myer Music Bowl is of cultural importance to Victoria as a major and long serving location for a wide range of open air cultural events and performances and is a well known venue through-out Australia. The Sidney Myer Music Bowl has architectural importance and is rare as the largest, purpose built, permanent outdoor performance venue in Australia. The Bowl was constructed during a period of experimentation in new forms of construction and since completion its tensile structural system has not been surpassed in scale or complexity. The development of the venue also embodied remodelling the surrounding Domain which was sculptured into a bowl with the sound shell providing an umbrella like roof over part of that landscape. The design sought to integrate built and natural elements in a harmonious and organic whole. The audience was provided for in an egalitarian manner with simple timber bench seats arranged under the permanent structure and an open sloped lawn beyond it. 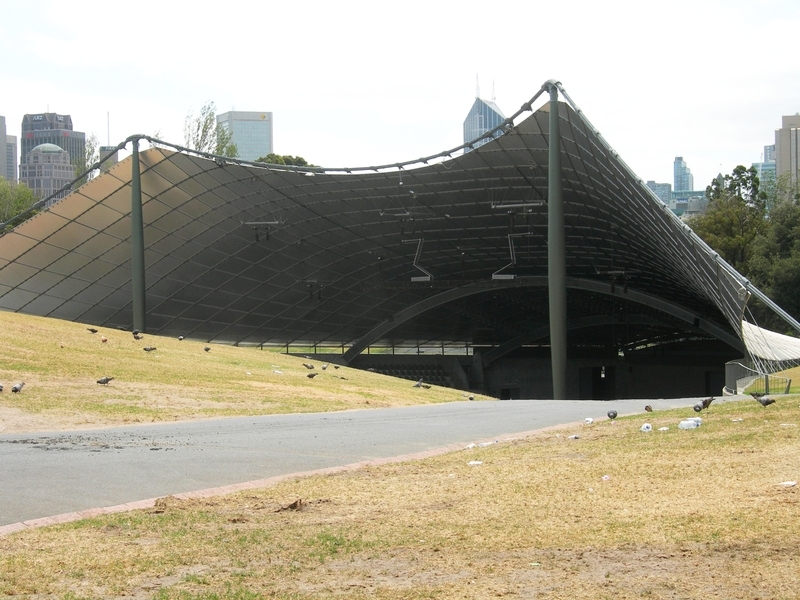 The Sidney Myer Music Bowl is of technical importance for its contribution to the development of engineering and construction techniques which were required to complete this large scale and technically unusual project. Sidney Myer Music Bowl, St Kilda Road, Melbourne, City of Melbourne. 1. The whole of the Music Bowl structure marked B-1 (including stage, timber bench seating and the retaining walls to the side of stage and rear of seating, and the 3 commemorative plaques on each of those retaining walls), on diagram number 600379 held by the Executive Director. 2. The whole of the land marked L-1 on diagram 600379 held by the Executive Director being all of the land excised from the Domain and managed by the Victorian Arts Centre Trust. 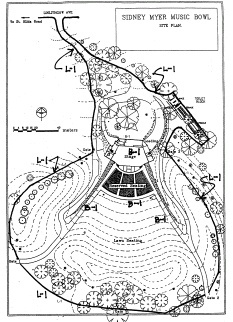 * Removal of intrusive, non-significant elements as defined in the Sidney Myer Music Bowl Draft Conservation Management Plan 1996 by Allom Lovell & Associates. * Non-structural alterations to areas of contributory or no significance as defined in the Sidney Myer Music Bowl Draft Conservation Management Plan 1996 by Allom Lovell & Associates provided those alterations have no affect on areas of primary significance.